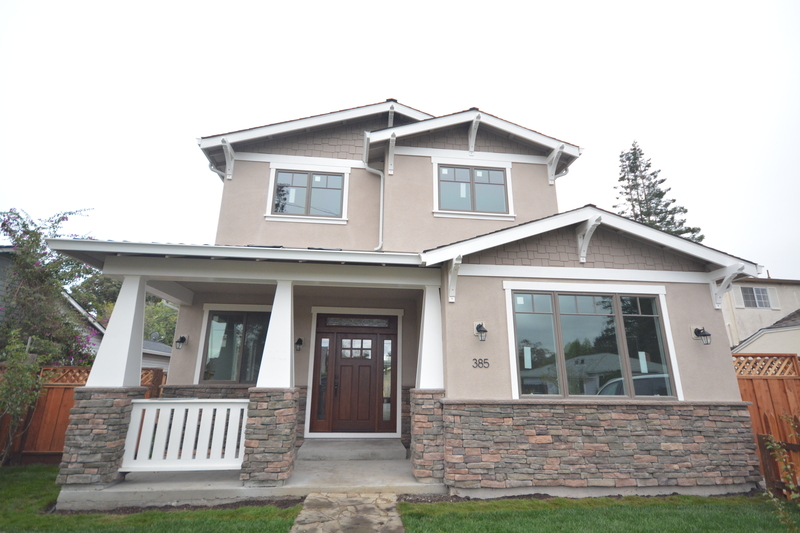 4 Bedroom 3-1/2 bathroom Craftsman style custom home, designed for narrow lots of Cupertino and Palo Alto. But can be modified to fit any requirements. This 2100 sq.ft. home was completely re-designed from 1 story ranch to meet Owner’s requirements. And add a 2nd floor with 3 new bedrooms and 2 bathrooms. We stepped in when Owner’s had a basic idea to expand living space for growing family and there was specific request to use design-build company, which will take care of the entire process from architectural drawings, engineering and construction. Originally 2-story ranch style home had about 1600 sq.ft. and was in very poor condition and too small for the family of 4 and lot size wouldn’t allow to simply build a 1 story addition on a ground level. We decided to maximize the square footage to the maximum allowed in this zoning district providing 4 bedrooms, 3 full bathrooms, 1 powder room, living room, dining room, open space kitchen with family room, keeping existing 2 car garage on a rear of the lot untouched, and to use Craftsman style for both exterior and interior. Plans approval process took nine month with minimum plan check comments. We had to solve privacy issues and concerns of adjacent property neighbors, get through architectural committee, complete engineering plans and calculations, address California Green Building Tier 1 requirements, California Title 24 energy calculations, and finally get construction permit approved. Existing house was knocked down to the sub floor level and re-built from scratch, with 9′-2″ high ceiling on a first floor, all new structural plumbing, electrical with power upgrade to 200 amps, new sewer lines, new HVAC, upgraded gas meter, 4,5 kWt of Solar panels added on a roof. Owner’s were very organized which help to maintain a project on a good pace, their response on tasks that they were suppose to complete and decision making process was super quick. They used a lot our online project management resource which helps to keep project communication, milestones and tasks organized. Therefore we’ve been able to order all long lead items right in time. Interior used a lot of custom carpentry, engineered hardwood by Urban Floors, granite and caesarstone countertops by Bedrosians, designer tile by Porcelanosa USA, linear Napoleon fireplace. On exterior we used a lot of exterior type trim for windows, doors and columns, faux beams, materials were provided by The Moulding Company, El Dorado stone on wainscoting around the house – Mesa Verde Mountain ledge with chiseled edge wainscot sill. Goal of the project: Maximize living space, design 3 new bedrooms on 2nd floor, Guest bedroom on 1st floor, Living room, open space kitchen and Family room, keep 2 car garage, add formal Dining room, powder room. The Premier of Progress-builders is one of the best person, knowledgeable structural engineer and good planner we've ever met. We did a major reconstruction of our home in Palo Alto, CA. Right from the planning and designing, the company took care of everything with a reasonable estimation and executed all the events in accordance with the schedule on time. After completion, all the review by the city is approved within first few reviews. I like very much and i strongly recommend Progress Builders in the Bay Area for remodeling and new constructions. Pavel Kantor from Progress Builders and his team did an outstanding job for the addition and remodel of my client’s home in Palo Alto. So outstanding that this remodel has already been published twice on online website and magazines!Speaking on behalf of MA Dimensions, their coordination with my team of Architects and designers, coordination with client through an online portal with progress and schedule updates far surpassed our expectations. Pavel was on top of things when it came to the construction side of the job and working with city during different phases of inspections.They stayed within budget as promised and finished construction on time with little to no glitches.I highly recommend Pavel and his team for remodel and new construction of homes. We are already working on a new project with Progress Builders and look forward to many more in the future.